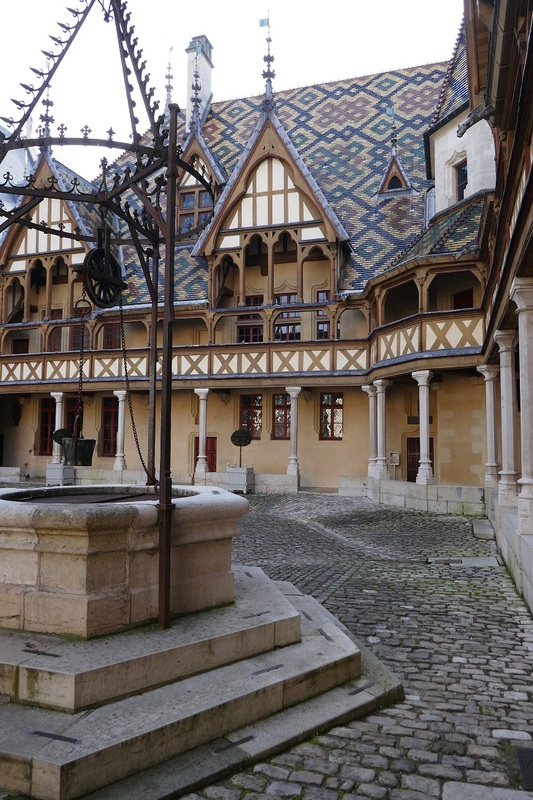 With a title like “Wine Capital of Burgundy” how could we not visit the city of Beaune (sounds like “bone” in English) especially since it’s only 18 minutes by train from where we were staying in Dijon? In the US we were big fans of public television, PBS, and especially travel videos from Rick Steves which is where we got our first glimpse of what this part of the Côte d’Or region had to offer. 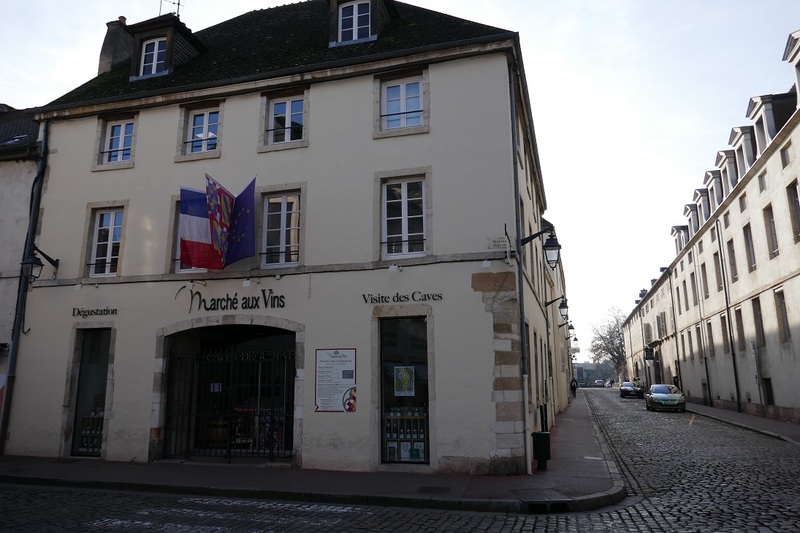 Thanks to YouTube, portions of those recordings are still available so with our memories refreshed it was time to see for ourselves why a famous New York City newspaper wrote an article entitled, “Seduced by Beaune in Burgundy”. photo because we were headed to the main historical attraction in the city, the Hôtel-Dieu. By 1443, this part of France had long suffered from the 100 Years’ War with England. 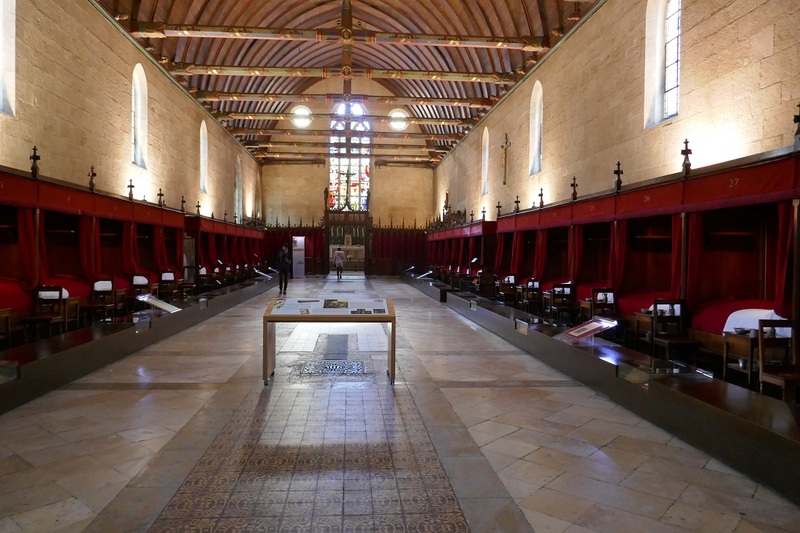 To help the people within his territory the Duke of Burgundy had a hospital/hospice built with a church in the center so that even bedridden parishioners could attend services. We found the most striking aspect of the building, however, to be outside. 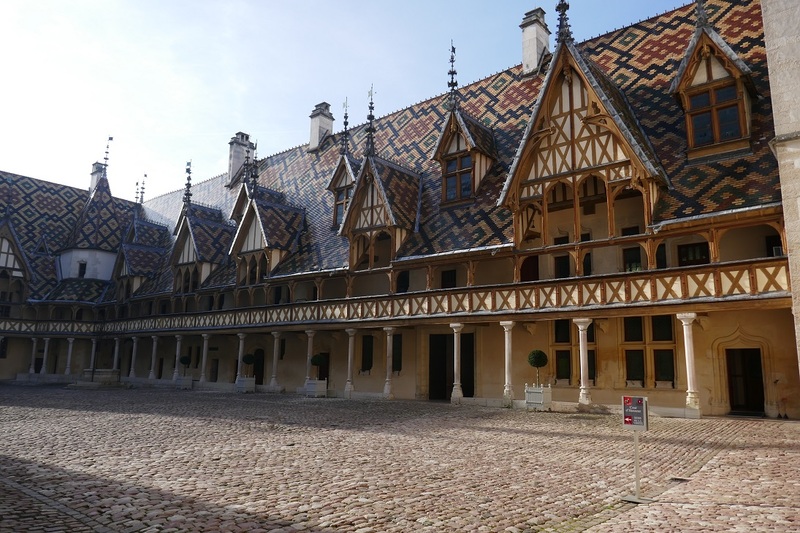 Similar to the roofs of many mansions we had seen in Dijon, red, yellow, green and brown glazed tiles are laid in geometric patterns after being fired 3 times to provide protection from the elements for up to 300 years. 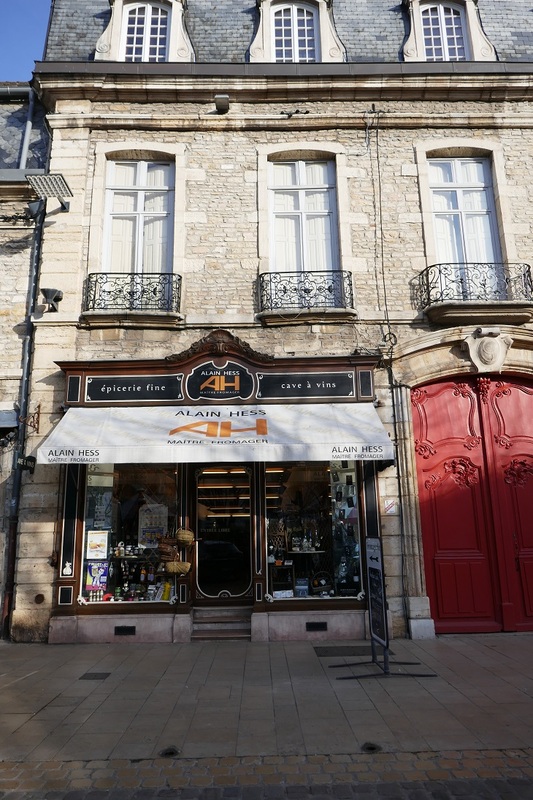 Conveniently located across the street from the hospice is the Marché aux Vins that we would call a wine market or candy store depending upon your viewpoint. From their website I learned that they stock wines dating back to 1958 and that tours of their cave are offered throughout the day with tastings of 5 to 12 wines, depending upon your ticket price. That’s where I also learned of their seasonal closing that included the day we were there. Oh well, we had lunch reservations anyway, so now we wouldn’t be rushed. Our favorite restaurant in Carcassonne, Le Blé Noir, is run by husband/wife team Christophe and Natalie and we were lucky to find a similar arrangement at La Buissonnière where chef Charlotte prepares the meals right before the eyes of the eager diners well cared for by Sébastian. Restaurant experiences in France aren’t generally rushed and that’s especially true in small establishments where the owners take pride in both the quality of the food and the service with which it is presented. The set menu came with 4 choices each for the starter, main course and dessert and there were numerous local wines by the glass to accompany the meal. We could have easily sat there for the rest of the afternoon, which would have been appropriate for a place named, “Playing Hooky”, (my rough translation) but we had more of the town to see. 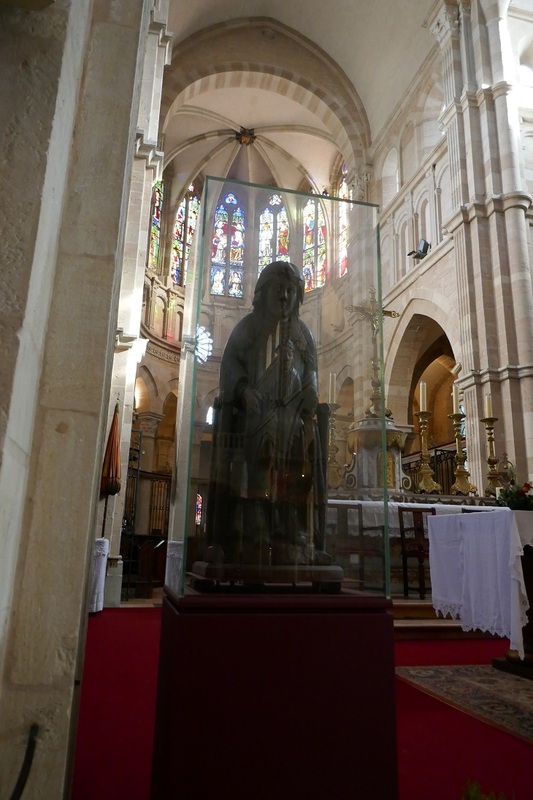 Our walk back to the station took us first to the Basilica Notre Dame where there is a statue of Mary and Jesus from the 1100s. Tapestries from the 15th century depicting biblical scenes line the back of the choir stalls. 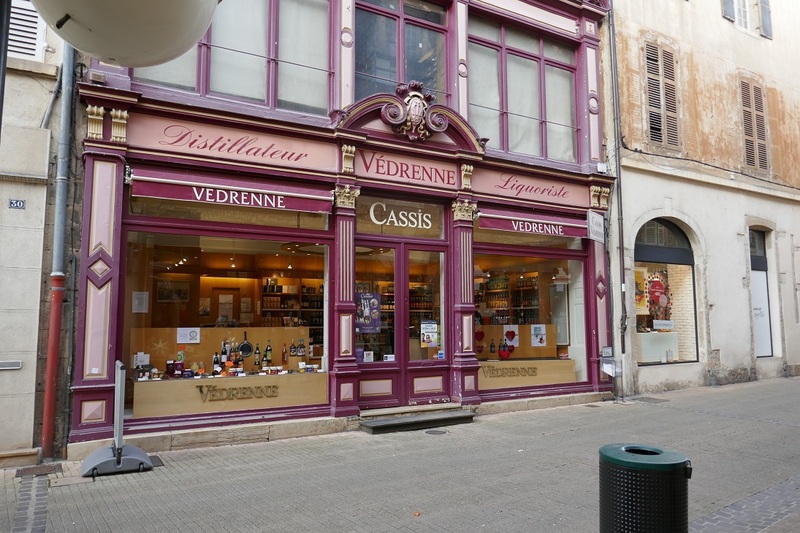 For more earthly delights we had a look at the Alain Hess fromagerie where they stock over 200 types of cheeses and at Védrenne, a distillery of the liqueur crème de cassis, a local specialty and one that we like too. Since the French word beau is typically translated in English as “handsome” or sometimes “beautiful” that seemed a logical origin for this town’s name but apparently Beaune is somehow derived from the Gaulish/Celtic god Belen/Belenos. No matter; we still found it beau and well worth the visit. 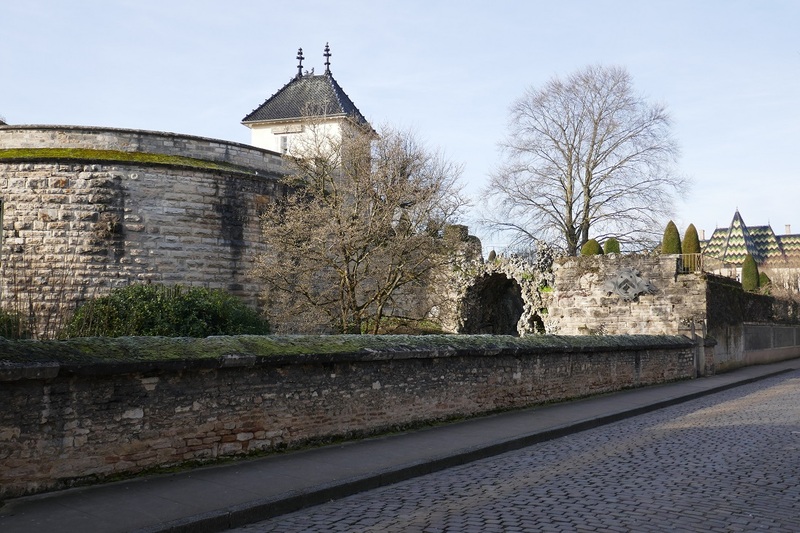 Posted on February 24, 2019, in Life in France, Travel in France & beyond and tagged Americans in Carcassonne, Restaurants, Wine. Bookmark the permalink. 2 Comments. I’m still reeling from the revelation that Grey Poupon originated here! I’d had no idea and just thought it was an American knock off trying to sound French! I have yet to see it in a supermarché here. Thanks for making us smile, too! 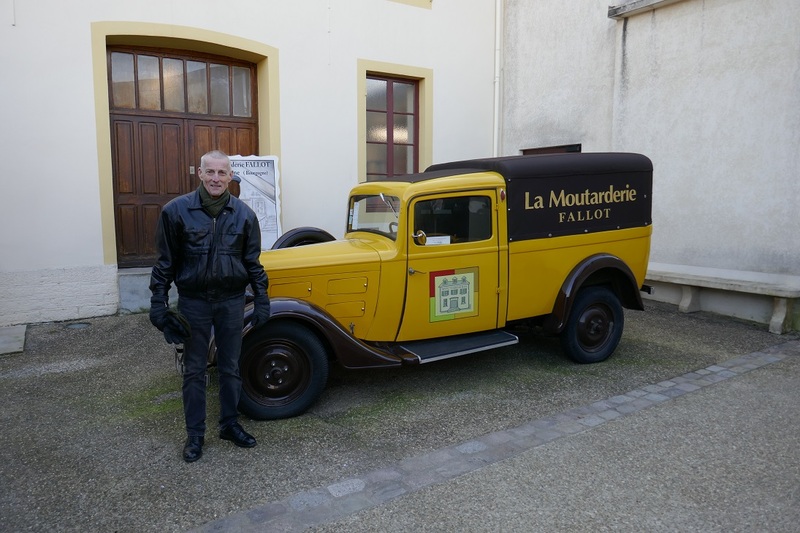 The mustard is sold under the name Maille here in France. It is now a Unilever subsidiary.